With Texas unrestricted land, you have a wide variety of options beyond a traditional single family home or a manufactured home. A Barndominium (or “Barndo” or Barn Home) is a barn built with either wood framing (post frame) or steel framing that is finished inside, either all or in part, as a home. These homes have become very popular over the past few years, especially in Texas, where they originated. 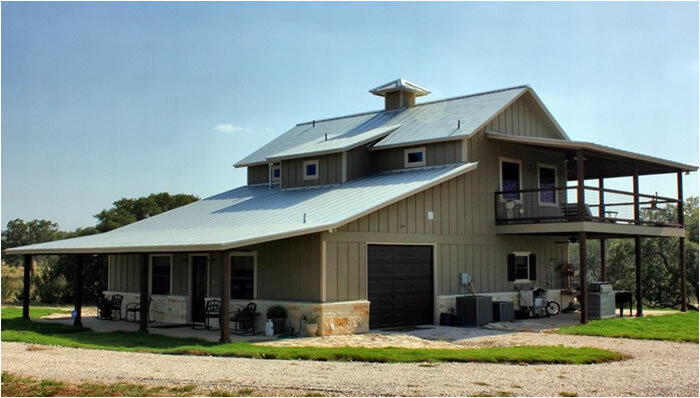 A barndominium is not just a “barn house”… but it can be a beautifully finished home. Usually, these homes range in size from 1,000 sq. ft. up to as much as 3,000+ sq. ft.
Barndominiums most often have a metal roof and walls, but can be constructed with an almost endless array of options such as wooden siding and a shingled roof. Most often, they are finished on the inside with a “back-to-basics” motif. But, as in the case with the roof and walls, this can also be elaborate depending on your taste. Barndominiums can be built in conjunction with a horse barn, shop, a business, or just as a stand-alone home. What Are The ﻿Costs ﻿Of A Barndominium? Putting an average cost on a barndominium can be difficult. However, you can find builders that will charge you $85 a sq. ft. for a complete buildout. This would include the building itself, high-grade finishes, and the slab. If you just want a basic shell, you can find prices as low as $20 a square foot. A basic barndo shell will include the slab, building, plumbing, metal or wood, electrical stub outs, vents, sinks, showers and washrooms. You can also purchase Barndominium Kits. These kits are essentially plans that are available at a low cost. These are predesigned plans and they offer everything needed to quickly build your barndominium. You’ll be able to choose from several different floor plans as well as square foot plans in an attempt to find the perfect plan for a home on Texas land. Another popular option when setting up a home on unrestricted land in the country is to convert a portable building into a small home. Portable Storage Buildings - like the ones pictured above were originally built for storage only and many of these buildings still are used exclusively for storage. 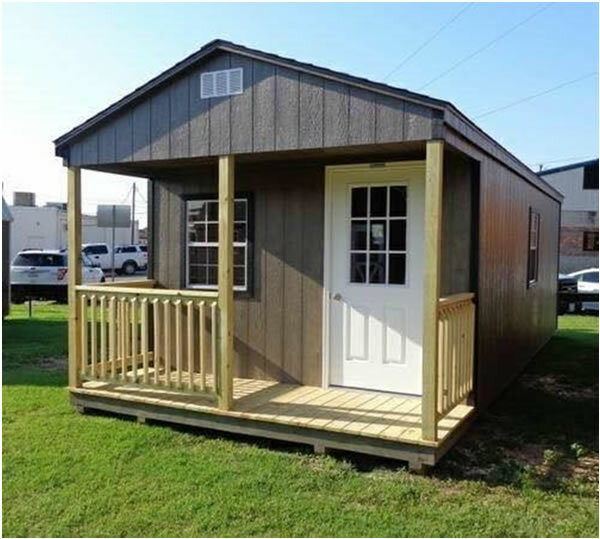 However, as the popularity of small and affordable living quarters has become more popular over the past few years… people have converted these storage buildings into little houses complete with beds, kitchens, and porches. 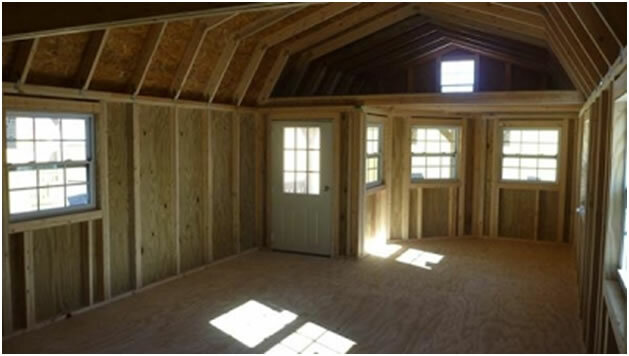 Buying a portable building as a shell allows you complete flexibility in customizing the inside finish-outs of your new portable building turned home. Some folks like to convert their units into very basic low cost homes inside… and others choose to install granite countertops, track lighting, and nice wood flooring. You truly do have a blank canvas to work from when converting a storage building into a small home. Most portable building shells range in price from as low as $8,000 up to more than $20,000 depending on which model you choose. A tiny home is a small house that is typically sized under 600 sq. ft. Tiny houses that can fit on a trailer have max dimensions of 8 feet, 6 inches wide by 13 feet, 6 inches tall, and 40 feet long providing a total maximum of about 340 sq. ft.
Often, these houses are built on trailers since they are too small to be allowed as permanent structures according to most local code enforcement agencies. Because of this, most counties classify tiny houses as recreational vehicles (RV’s). The Tiny House Movement is the architectural and social movement that advocates living simply in small homes. Some of these people buy their tiny house pre-built and others choose to build their own. The reasoning behind people wanting to build tiny is normally one of three reasons: To save money… to simplify their life… and to help the environment. There are many companies that can build these for you from start to finish. 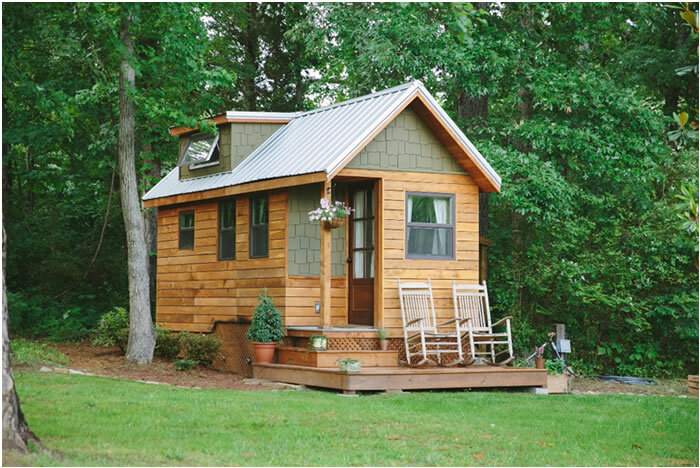 A tiny home can cost as little as $25,000 up to over $100,000+ for a luxury tiny home. Financing for Barndominiums, Storage Buildings and Tiny Homes has become much easier over the past few years… and you have a few different options. The first most obvious would be a cash purchase. The other two viable options most buyers choose are either a personal loan or doing a “rent to own” with a bardominium or storage building company. 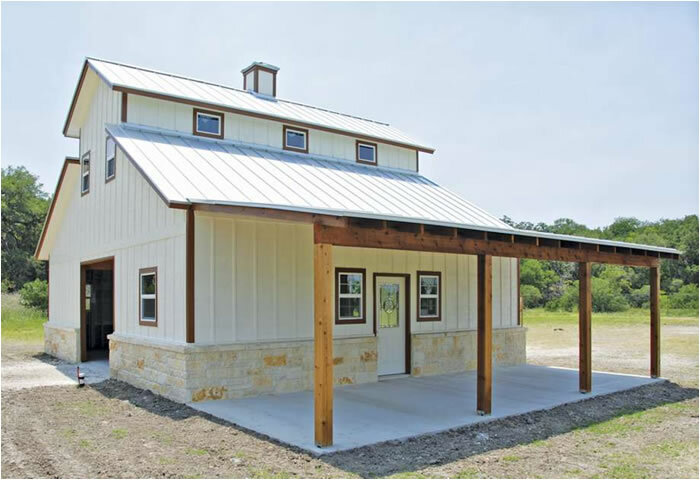 We have a variety of funding sources that can help you with funding the purchase of a barndominium, storage building, or tiny homes anywhere in Texas. We can also connect you with some of the top building companies in the industry that can provide you with affordable monthly payments on a rent to own plan.